The version I have of this movie show the One-Armed Swordsman standing over Zatoichi who is alone and on one knee. When the one-armed swordsman walks away a few feet he collapses. 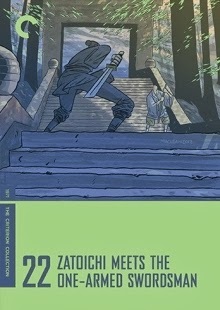 Zatoichi is shown again still alone and on one knee. In a book about the hong kong film industry called "Kung Fu Cinema of Vengeance" by Verina Glaessner published in 1974 she refers to a "japanese original" of the film. On the next page one of the pictures shows the one-armed swordsman standing over Zatoichi who is apparent injured lying on the ground in the arms of one of the two women that were present in the scene. I live in Hawaii and saw both versions.I n one,zats died and in the other,want yu died.David henna from Hawaii. This was a long time ago. But only the last thirty seconds differed. Many scenes in the film were overdubbed differently in post-production. So although what each audience saw on screen was the same (in each version) the narrative was made somewhat different. I am not sure why this site is claiming the Japanese version doesn't exist... I saw it on a bootleg VHS in the mid 1990s, complete with English subtitles... So there must be some kind of 'master' version somewhere which that copy came from. The whole premise of the movie seems to be quite nonsensical. Why would they fight without having anybody to sort things out? That's just stupid. Though of course I guess to get two heroes at that time to fight each other you must use "misunderstanding" as an excuse then. Also I think it's not hard to imagine they use slightly different cuts of short sequences in different places. After all who wants to see their own hero dying/doing wrong?